Coated strings are a thing of the past. No flakes, no cracks, no peeling and no muffled tone. Using a sophisticated Ionic Vapor Process developed by Acoustic Science, proprietary compounds are activated in a glow discharge electromagnetic plasma, and the surface of all strings are modified. The result is a string protected from dirt, oil, residue, and tarnishing. Most importantly, string playability and life is extended without flaking or compromising tone. 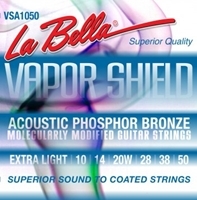 The entire surface and full-length of all strings are treated with a nucleated polymer vapor material that requires hours of complex prep and processing; no spraying or dipping. I've had these strings on for 7 months, still have great sound but wound g is starting to wear on windings from performing a lot of string bending, definitely sticking with these.